Maintaining a safe construction site is one of the most important components in a construction site safety program. Maintaining said safety is also one of the most difficult. Construction site maintenance involves almost all elements of the site and requires constant diligence on the part of builders and developers. While achieving construction site safety is a challenging goal, state and federal laws and regulations both guide construction site operators and hold them accountable. When they fail to operate a safe construction site and injuries occur, injured workers usually have the right to pursue compensation. Learn how The Orlow Firm can help you after a construction site accident in Brooklyn. Call (646) 647-3398 or contact us online. We offer free initial consultations. Did you fall through an unprotected and unfinished stairwell? Did you slip while moving a wheelbarrow up or down a slippery surface? Were you required to move unsafely from one scaffold to another? You may have a right to pursue both a workers’ compensation claim and a third-party claim. Third-party claims, which are filed against someone other than your employer or co-worker, can result in higher monetary awards that workers’ compensation. 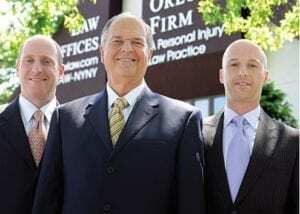 At The Orlow Firm, our attorneys have more than 30 years of experience helping clients obtain the results they deserve. Undocumented workers have the same rights to compensation as other workers in Brooklyn. For more information, review our page on undocumented workers. Se habla español. If you are injured in a construction site accident, call Brooklyn personal injury attorneys at The Orlow Firm. To learn more about how we can help you, contact us for a free initial consultation. You will always work with a named partner at our firm, and we believe that you should expect nothing less. Call (646) 647-3398 or contact us online. We can go to you if you cannot come to us.